Large (12 - 14) - $46.99 Only 1 left! Here's the mission goose, we need to fly this plan to dangerous territory. Gear up it's going to be a bumpy ride. Free flying just like a bird through open sky is beautiful. Once you go up coming down is not something you want to do. Barrel roles, and spiffy maneuvers may make pilots nauseated but are stunning from the air. Once you're up there the earth looks so small. Pilots can see everything from the sky. As the fighter jet glides through the air everyone holds a sense of awe. A well-designed machine driven by one heck of a talented girl. She knows all the perfect maneuvers. So what if it's just a fantasy? Fantasies are the place dreams start so they can someday become true. 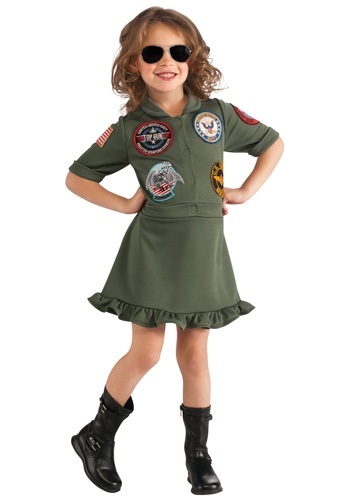 Your pilot can start day dreaming about flight wearing the licensed Girls Top Gun Flight Dress. This licensed movie costume is sure to get kids excited about flying jets. The dress is 100 percent polyester with a zipper front. Patches are attached to the front and sleeve of the costume with a ruffle hemline for a feminine detail. For more polish gold framed aviator glasses come with the costume. Add some cool boots and the look will be complete. Watch as your girl takes off to new levels of flight. Goose and Maverick are excited to meet the new pilot.